Roll Top Conestoga Trailer Service USA | Online Roll Top Conestoga Trailer Service - Ameri Management, Inc.
Are you in need of a Roll-Top Conestoga Trailer Service USA? At Ameri Management, Inc. we value your business just as much as you do and that’s why you can always rely on us to find you the best, fastest, and most affordable Roll Top Conestoga Trailer Service USA for your logistics and transportation needs in North America. Our Conestoga Trailers utilize a moveable tarp network on the trailer to maximize space for a wide variety of loads, this has made these specialized trailers one of the most popular in the cargo transport industry today. What’s the main benefit of using our Roll Top Conestoga Trailer Service USA to move huge or bulky equipment or machinery? Well, its suitable for transporting delicate cargo that needs protection from the elements. The trailer’s rolling tarp-on frame structure is designed to protect oversized and specialized goods during shipment, they ensure Quality Freight Transportation Services by keeping your cargo safe from external factors without compromising on paint, finishes, delicate equipment or other aspects of your cargo that may get damaged if a tarp is placed over the load. 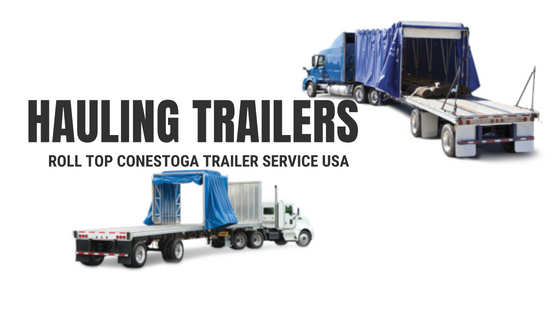 Why Should You Choose Our Roll Top Conestoga Trailer Service USA? With their ability to switch between enclosed van loads and flatbed-style loads, Conestoga Trailers allow shippers to serve a wider market range thus increasing their overall bottom line. They are also low-maintenance and much cheaper to insure compared to other types of trailers. Furthermore, the Conestoga Trailer can be independently accessed from all sides thus allowing drivers to add extra loads to the trailer, but without interrupting access to the freight which is already on the trailer yet to be delivered. This creates a unique advantage both for the shippers and their clients. Likewise, the Conestoga Trailer allows drivers to ship cargo in a timely manner thus helping deliver the products that makes our nation work. Drivers don’t have to waste precious time transferring heavy tarps on and off the flatbed, they can simply strap down their cargo and lock up the moveable curtain tarp for a quicker and more efficient delivery. This not only helps in faster loading times, and reducing delivery time but also streamlining overall operations. Roll Top Conestoga Trailers provide a useful solution for shippers or receivers who have no access to a docking point, the Conestoga Trailers have a moveable tarp system that retracts in any direction thus providing easy access to multiple forklifts if necessary. Additionally, the independent access provided to all sections of your load from any point along the route means several drop-loads can be achieved from a single Conestoga Trailer. These features allow drivers to add additional cargo on the go much quicker than typical Flatbeds or Dry Van Trailers. In conclusion, due to their specialized functions and features, Conestoga Trailers can be a big investment for haulers. At Ameri Management, Inc. we partner with manufacturers, distributors and shippers to provide customized transportation solutions to meet any need by utilizing Roll Top Conestoga Trailer Service USA to help our customers, shippers, you, alleviate the extra costs of buying and maintaining your own Conestoga Trailers. We will provide you with our specialized trailers that can be used for delivering Foods and Beverages, Building and Manufacturing Materials, Tools and Heavy Machinery. Conestoga Trailers will help expand your shipping capabilities and also improve efficiencies in your supply chain. For the best Roll Top Conestoga Trailer Service USA, you can only rely on Ameri Management, Inc. to get you the best logistics and transportation solutions for you. We work fast, we are reliable, and our prices are usually very competitive. Don’t stress anymore about shipping, leave that to us because we’ve got what it takes to get the job done.